Welcome to my website. 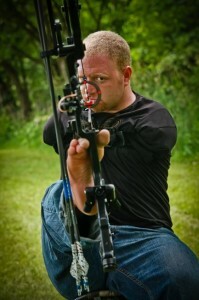 My name is Matt Stutzman, the Armless Archer. I was born without arms but was blessed to have been raised by two incredible (and incredibly patient) parents who taught me long ago that impossible is a state of mind…and not one that I should embrace. It’s a lesson that has served me well, and one that my wife and I are trying to pass on to our three young boys on a daily basis. My goal is to be the best archer in the world. For a man without arms that may seem unlikely, but, indeed, where this is a will, there is a way and one thing I was definitely NOT born without was a will. I have figured out how to do a lot of things in life sans arms (see more under ‘Other Than Archery’) one of which is shoot my bow. I’ve gotten pretty good at it and am a proud member of the United States Para Archery Team. I competed at the 2012 London Paralympic Games and won a Silver Medal. Please join me in what I’m sure will be an incredible journey.